Which Inverter is the Best for my New Solar System? What’s So Great About Microinverters? Hello, solar enthusiasts! Have you been wondering which inverter is the best to use on your new solar project? If so then this article is for you! You know, solar panels get all the glory, but it’s the inverters that do all the work in the solar energy system. Central string inverters that came with solar systems of the past — let’s say up until 2018 – managed the conversion of DC to AC voltage for the entire solar system. That meant if one panel went down because of shading or a mechanical issue, the entire system would stop producing. Then microinverters were developed out of Fremont, California by a company called Enphase®. These people were working on the central string inverters for a big company until they decided to go out on their own. They created an inverter that would convert the DC energy produced by the panel into usable AC voltage for your home. Nobody else is doing this, and the central string inverter companies were thrown for a big loop because these new inverters are also warrantied for 25 years instead of 10. But undeniably, the best thing about Enphase® is their inverters are double insulated for proper grounding and small enough to be placed at each individual panel. Because each panel has its own inverter, if one panel goes down because of shading or a mechanical issue, all your other panels will still continue producing clean energy for you. New, But Are They Safe? These microinverters are UL Listed, relating to voltage and frequency, synchronization, disturbances, faults, and reconnect time. This UL Listing ensures that your grid direct system meets IEEE 1547.1-2005 which specifies the type, production, and commissioning tests that must be performed on these microinverters. On our permits, we must show that these microinverters comply with the Rapid Shutdown requirements of NEC 2014, Section 690.12. This applies to PV conductors over 10 feet from the PV array and requires that the conductors power down to 30 volts and 240 volt-amperes within 10 seconds of rapid shutdown initiation. Enphase® products do it in less than six, making your house safer during power outages. To me it’s so interesting how one company can change the composition of an entire field the way Enphase® has done with solar. The old DC inverter companies are now trying to play catch up. The way they’re duplicating Enphase® technology is by creating “DC optimizers” at each panel, which act just like a microinverter in the way that allows the rest of your solar system to work even if one or two panels go down. You’ll still have a main inverter down on the side of the house, but you’ll also have DC optimizers at each panel, mimicking Enphase’s® technology. They had to! My territory manager, who gets me my solar parts and equipment in Sacramento, tells me his top 3 grossing solar companies all use Enphase® microinverters. DC inverters are getting dropped quickly as outdated technology. Happens all the time. Which Inverter Does Fox Family Install? Fox Family installs Enphase® microinverters because they are the best technology for today’s quality driven customer. You can watch our latest video on this topic, here. The price comes out the same on the jobs, too. The industry did a good job of pricing them similarly. We also use Quickmount® PV flashings and racking. I’ll leave a link to Enphase® and Quickmount® PV in the space below if you’d like to learn more. Both companies are engineered right here in California. They are produced in China, but there isn’t one inverter company manufacturing their own inverters here in the US, unfortunately. Okay, just to geek out a little bit, I wanted to point out a couple of things I really like about Enphase® microinverters. Most importantly, since they are located right at each panel, the maximum power point (MPP) of each module is tracked and sent to your monitoring app on your phone. Enphase®’s is called Enlighten. I’ll have a video out soon about Enlighten and the cool features it has, like monitoring your production. Shading only affects those modules it’s shading rather than the whole system. Solar panels can be installed at different angles and azimuth orientations, unlike central string inverters which require all the modules in each source circuit to be at the same tilt and orientation. We’re not running high voltage DC circuits through your attic or across your rooftop. We’re running AC voltage instead. 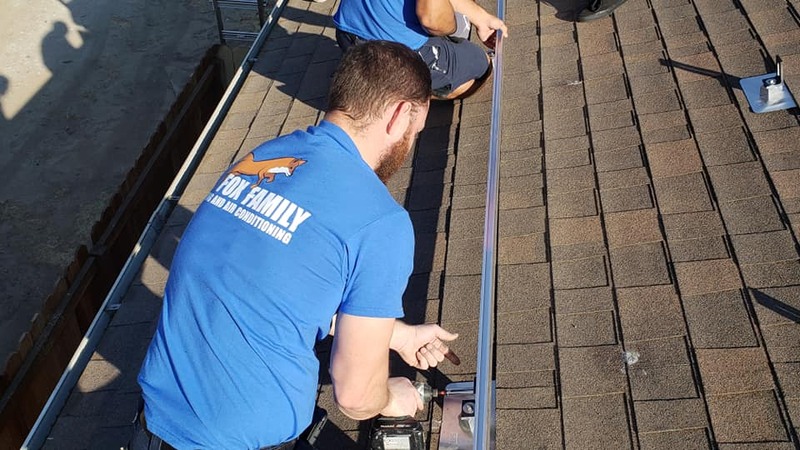 If you’d like to see Fox Family installing one of our recent projects, please visit our YouTube channel and see us in action installing solar. Thanks so much for checking us out here at Fox Family. We want you to feel good about the products we use. We only choose the products we would use on our own houses. In fact, our house is getting solar done this week. It will be nice to finally have my own solar system running! You can read more about Fox Family solar installations here. We’ll see you on the next blog!